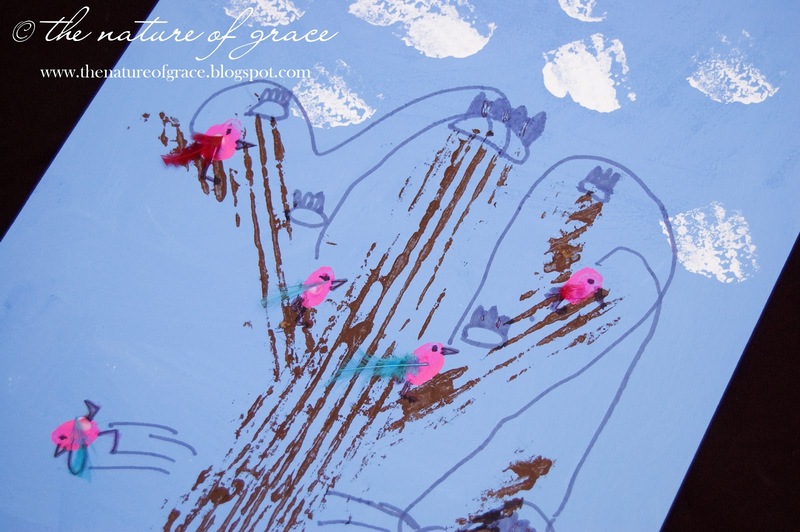 The Nature of Grace: Homeschool Theme of the Week: Birds! Homeschool Theme of the Week: Birds! Muffin Cups 1 & 2: blackberry clouds. Muffin Cup 3 (NOT shown): peanut butter "mud" for spreading all over the Peeps! 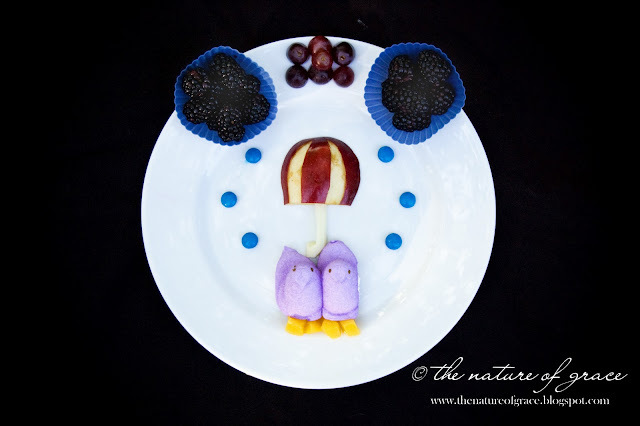 Other items: Purple grape clouds, red apple umbrella (I saw a photo of some amazing apple umbrellas on Pinterest - I think you can find them on www.cutefoodforkids.com - and thought I would try one) with a string cheese handle, purple Peeps with peach boots, and blue M&M raindrops. We learned about different types of bird nests and then attempted to make one of our own! 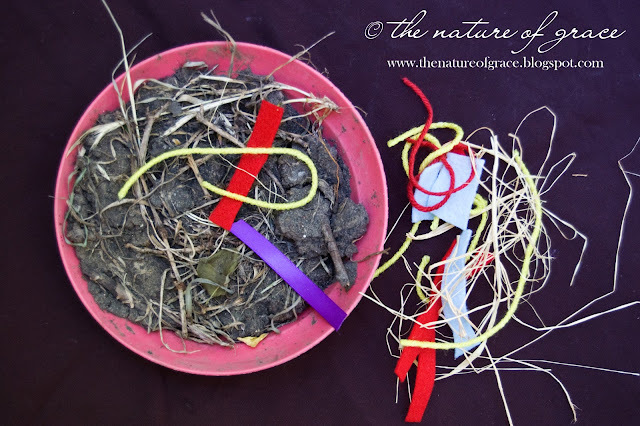 This is a great activity for kids who love to get down in the dirt and mud, squishing it around in their fingers as they construct a nest. Miss A also practiced the art of making a nest cozy by adding pieces of ribbon, felt, etc. to it. 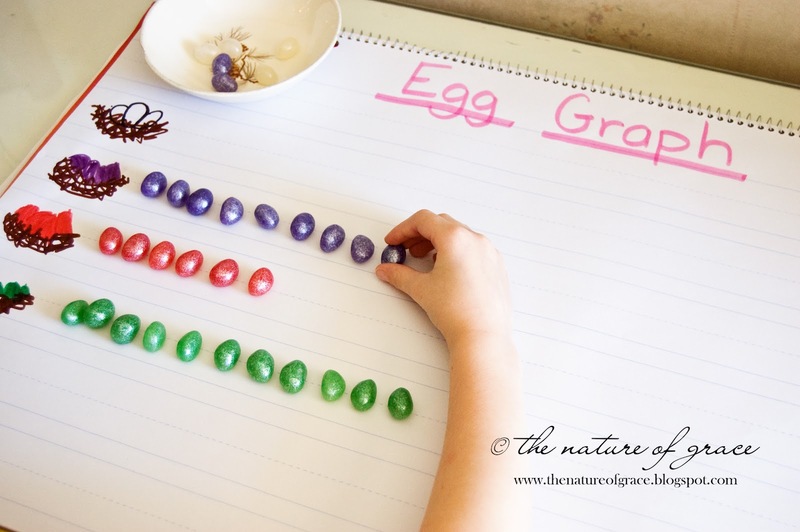 In order to incorporate some addition, she added two numbers together to determine how many items to add each time. 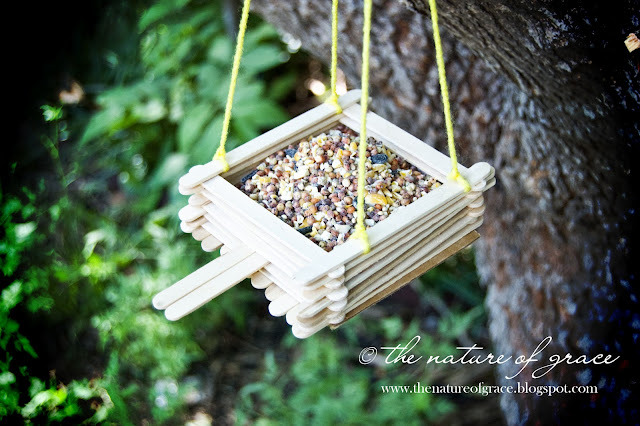 I found a neat bird feeder idea on Pinterest (see it here), so we made one and filled it with seed! I wonder who our first feathered visitor will be??? 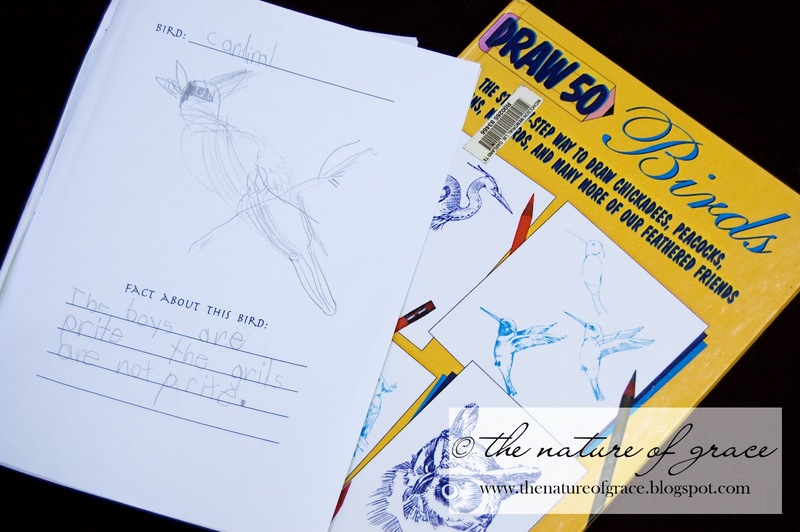 We found a neat book in the library illustrating how to draw a large variety of birds, step by step (see the link at the bottom of this post if interested). Miss A chose some to draw and then we looked them up on www.allaboutbirds.org so we could listen to the sounds the birds made and learn a bit more about them. These two bird houses are not only a fun and simple craft, they are also serving as a science experiment. Miss A painted one in bright colors and one in camouflage colors. The goal is to see which house attracts more bird attention. Who knows - maybe a feathered friend will even decide to nest in one (or both)! Peepscake, anyone? We followed a very simple no bake cheesecake recipe. We then melted some chocolate and mixed it with edible Easter grass to make our nest on top of the cheesecake. 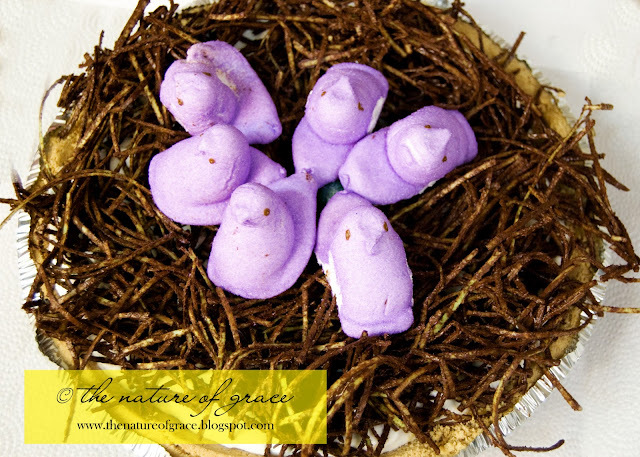 Jelly bean "eggs" placed under the Peeps in the nest were the finishing touch for a yummy dessert in honor of our bird theme! 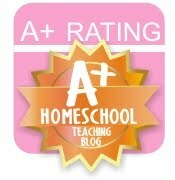 For anyone interested in incorporating a bird theme into a homeschool or classroom environment, I highly recommend this free website www.allaboutbirds.org. My kids loved it! You can learn about different types of birds, listen to the sounds each makes, see pictures and videos (if available), etc. We were especially captivated by the live video we found when we looked up the Great Blue Heron and could see one up close sitting on her nest of eggs! What great homeschool ideas. I too am a homeschool parent. (Bird Nest Cupcakes) Now, we have two things in common. What a cute study! 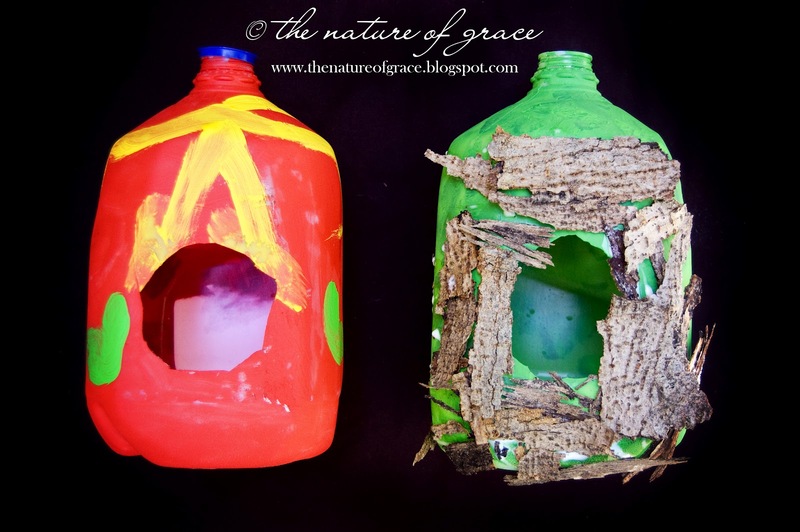 I love their milk gallon bird houses! Awesome! My daughter loves birds and works actively in wildlife rehabilitation. Her favorites are the eagles and hawks. She is a Veterinarian and gives her time freely to the local center, you can visit them at www.badgerrun.org for some great pictures of them. Such adorable ideas! Love the peepscake. I finally let my kids eat Peeps for the first time the other day and now they keep asking for them! Thanks for sending to me:) Just posted on Craft Gossip!! You have so many great ideas here. I love each one. Way to make learning fun. My daughter and I have been sick and are running out of things to do around here....but we are making that popsicle stick bird feeder this weekend:)Thanks so much for all of these cute and fun bird ideas! I adore your blog! I always know I am going to stop by and be totally blown away by all your fun ideas. 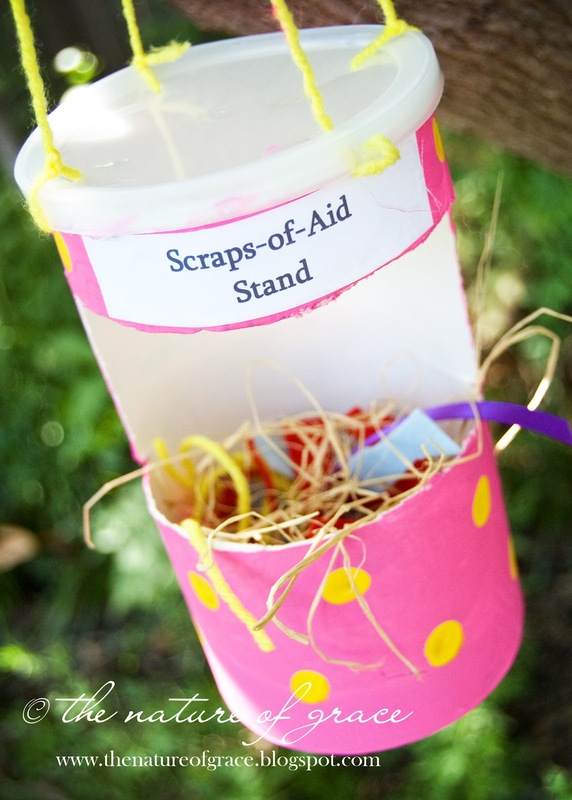 I adore your Scraps-of-Aid Stand. What a great idea! I love the little bird feeder. We made a treasure box out of popsicle sticks a while ago and since my son enjoyed that so much, I know he would love making a little bird feeder too! LOVE your bird study - WOW! The bird feeder is super creative & cute. And your edible bird nest is way too pretty to eat =-) I featured this on TGIF this week - http://livinglifeintentionally.blogspot.com/2012/05/tgif-linky-party-28.html - Thanks for linking up - can't wait to see what you link up this week!! I have enjoyed your blog and am awarding you the One Lovely Blog Award. Please follow this link to my announcement post to learn more about it. I love all your bird ideas! We are definitely going to try some of these activities! Thanks so much!